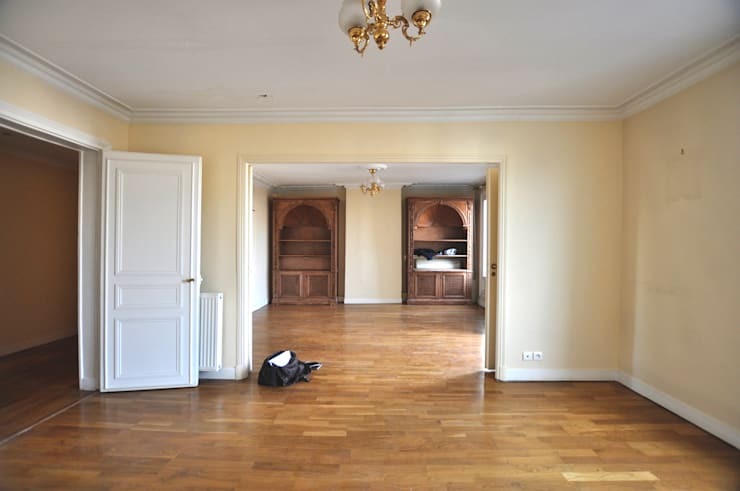 Quaint and old-fashioned apartments in the dreamy city of Paris can be extremely enticing and replete with nostalgic charm. But since this romantic and artistically rich tourist destination is increasingly a hub for modern professionals and young families, the old abodes in the city are crying out for more contemporary upgrades. So here we are, in Wagram Avenue, where this once graceful but outdated residence was given a futuristic makeover by the architects at Legarrec Architectures. Post renovation and restructuring, the apartment is an intensely stylish, bright, and cleverly planned and organised space. So read on to find out more about the drastic change it underwent! As is evident from the image above, the old abode needed some significant changes to make way for the new and fashionable accents of the revamped apartment. 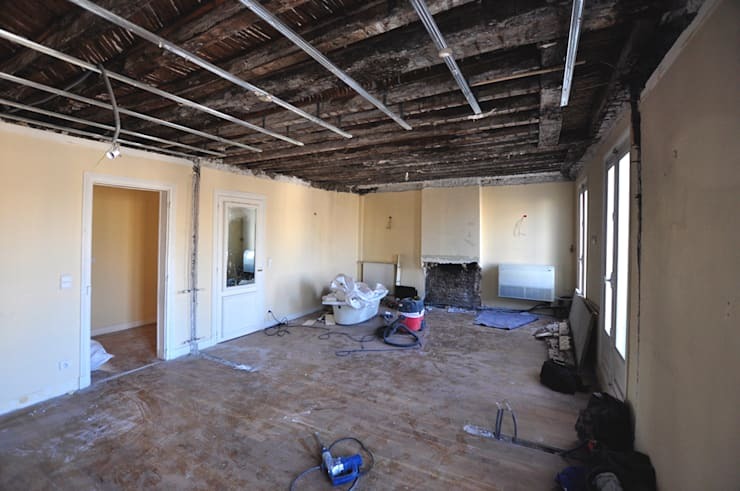 Walls had to be demolished and the flooring had to be rehauled. Previously, the dining and living areas were demarcated by a wall and large doors. The interiors were quaint, but a more updated layout was called for. The architects essentially wanted to introduce more openness into this space. The ceiling, as you can see, was completely redone and certain portions of the walls were modified too. So it was not a simple case of redecoration or subtle redesigning. Basic modifications were made to infuse the apartment with a decidedly modern ambience. The living space has now been cleverly integrated with the dining area and sports an airy, expansive look. The pristine white walls complement the new polished wooden flooring nicely, and dark furniture dots the space for some much needed contrast. Modish artworks deck the walls and storage units, while the sudden pops of red add a hint of glamour and fun to the room. Storage needs have been adequately taken care of with the help of this sleek and glossy wall-to-wall unit, punctuated by doorways which lead to more private quarters. Both closed cabinets and open shelves line this unit to accommodate both objects you'd like to flaunt and those that you'd rather hide. White combines with the subtle richness of wood to concoct corridors which are cheery, bright and sparkling clean. This one also features a peek-a-boo effect, and lets you take a sneaky look at the living area on the left as well as the bedrooms on the right. 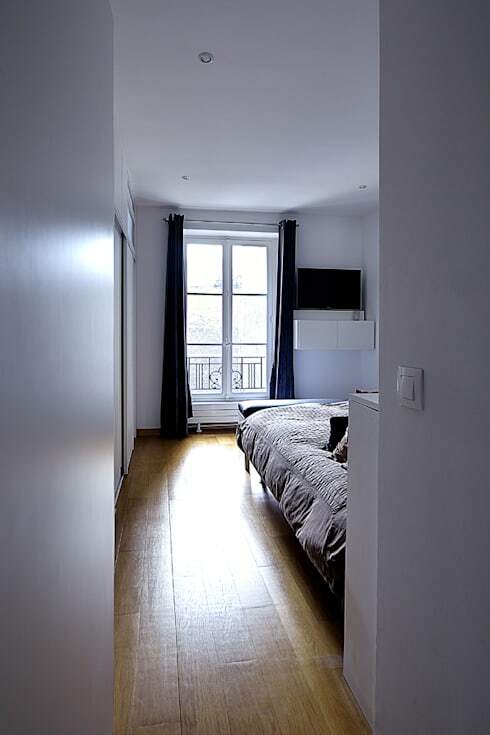 This simple but comfy bedroom comes with a quintessential Parisian window, leading you to an artistic and quaint balcony. The generous dimensions of the window ensure that the room gets flooded with sunlight during the day. 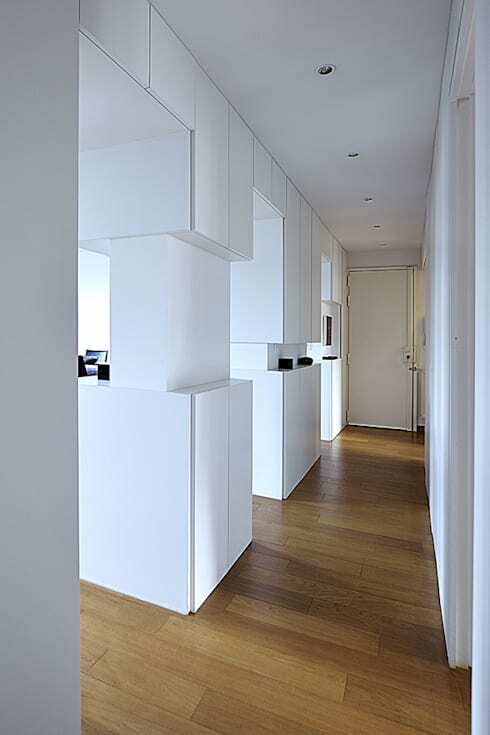 And the wall-mounted TV unit saves precious floor space in this compact room. 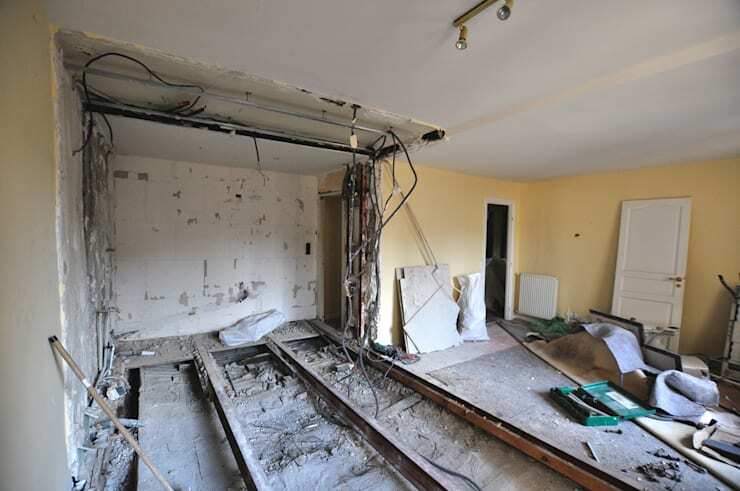 So you see how sometimes major changes are the need of the hour when you want to give your old home a brand new look. 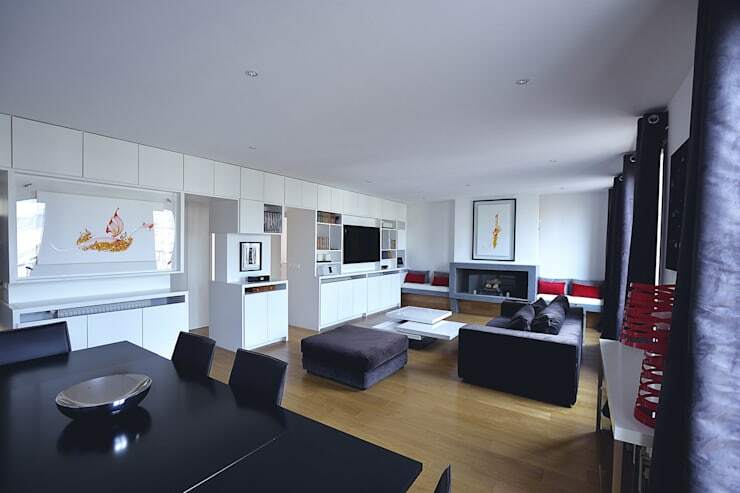 This apartment, for instance, does away with all dated accents, and ushers in ultramodern touches for an impact which stuns the modern homeowner. Here is another before & after story to keep you inspired: Let the light in: a Japanese apartment transformed. Are you a fan of the unique storage solutions in this revamped home? Let us know!